My best friend from college, Martha, persistently begged me to get onto Facebook and finally I did. I found out that even though there were “posts” to read nearly every day, this was by no means a way to truly catch up with her and her life except for photos when they’re posted. It is too contrived or something. And too public. So I traveled to Virginia to see her and then started writing her real letters. So much better and much more personal and satisfying. In my cooking life, I’m also not high-tech when it comes to kitchen gadgets and for much the same reasons, I think. Over the years I have seen new and improved kitchen and cooking gadgets come and go without even a thought of buying them. Not that they’re all bad–I do have a few favorites–but really my basic cooking tools do the job and for the most part I don’t need choppers, grinders, processors, slicers, dicers, “bullets,” electric grills, yoghurt makers, or a Darth Vader bread-imprinting toaster. I don’t even want or need a microwave. Give me a good knife, a cutting board, some cast iron and stainless steel pots, a gas stove and I’m good to go! I do love a high-quality sharp knife which is a must for cooking. Cheap or dull knives in the kitchen are dangerous and you will never get a consistent, aesthetic product with them. My current favorite knife is the Shun Elite and I have a big vegetable knife and a smaller paring knife. This is practical and convenient. Me and my knives can take on any chopper-slicer-dicer thingy. I can julienne carrots like nobody’s business, cut dozens of paper-thin cucumber slices or dice an onion faster than you can load your slice-a-matic. Cole slaw? No problem. And my clean up is a wash off of a knife and a few swipes of the cutting board–nothing to disassemble, get into the corners and crevices to clean, dry all the parts and put back together. Who wants that mess?!! If you learn to use your basic kitchen tools right, you will find they are the quickest and most convenient way to get a great meal prepared. It is also the way to get the most aesthetic and delicious meal. You can’t exactly imbue a lot of “life” into food when you’ve trapped it into a set of electric-powered blades and mowed it down to size or scrambled its molecules all to pieces in the nuker. Using a good knife and hand-cutting vegetables is an art which allows you to implement your intentions and creativity in a way that really communicates in your finished dish. 1. My mother’s food mill. This is by far the best kitchen gadget for mashing things. 2. 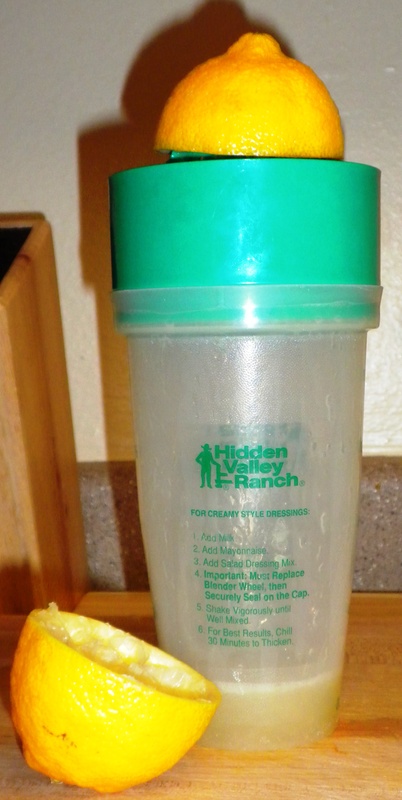 A plastic lemon juicer that came free with coupons and purchase of a popular salad dressing mix. A former roommate got it and I inherited it. You can’t beat this thing for getting a lot of fresh, seed-free lemon juice fast. 3. The Garlic Pro E-Zee-Dice. 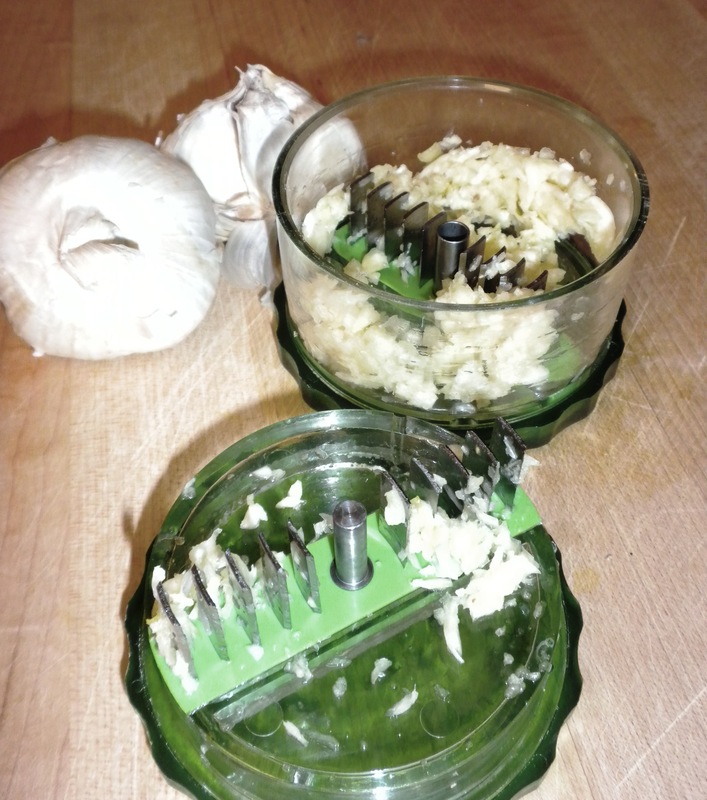 Mostly I use my knife and regular garlic press to prepare garlic. But this thing dices so much garlic so fast it is amazing! I use it because it works oh so well and I LOVE garlic. None of these things are electric but all of them are time-consuming to clean after use. For the most part, gimme my good knife and big ol’ cutting board. That’s my idea of high-tech in the kitchen. That’s how I roll. So where do you stand on the whole kitchen gadget situation? And do you ever write letters? This entry was posted in Cooking, Food, Life and tagged Cook, cooking life, Cutting board, gadgets, high-tech, Kitchen, Kitchen knives by mycookinglifebypatty. Bookmark the permalink. This is a great article, who would like to see Patty make videos of how to use the knife!!! I’ve had the live demonstration, and I use nothing in the kitchen for preparing vegetables, fruit or anything else other than the knife. Who has space for food processors? You have learned well, Grasshopper!